Buddhist, Hindu, Jain, Sikh and Christian representatives had participated in a conference on Tuesday organized by the Pontifical Council for Interreligious Dialogue. Pope Francis on Wednesday briefly met a delegation of Buddhists, Hindus, Jains and Sikhs who participated in a one-day conference in the Vatican, and another group of Buddhist monks from Thailand. The Vatican’s Pontifical Council for Interreligious Dialogue on Tuesday organized a conference on the theme, “Dharma and Logos – Dialogue and Cooperation in a Complex Age”, in which some 200 representatives of Dharmic religions that originated in India, and Christians participated. In this regard, Pope Francis recalled the meeting in the Vatican between Blessed Pope Paul VI and the Venerable Somdej Phra Wanaratana, whose portrait can be seen at the office of the Pontifical Council. ROME – In a time when the world is mired in conflicts, religious leaders have a duty to show that it is possible to set aside differences and work together for the common good, Pope Francis said. “Dialogue and cooperation are essential at a time like our own when complex and unprecedented factors have led to increased tensions and conflicts, accompanied by violence on both a small and a large scale,” the pope said May 16. 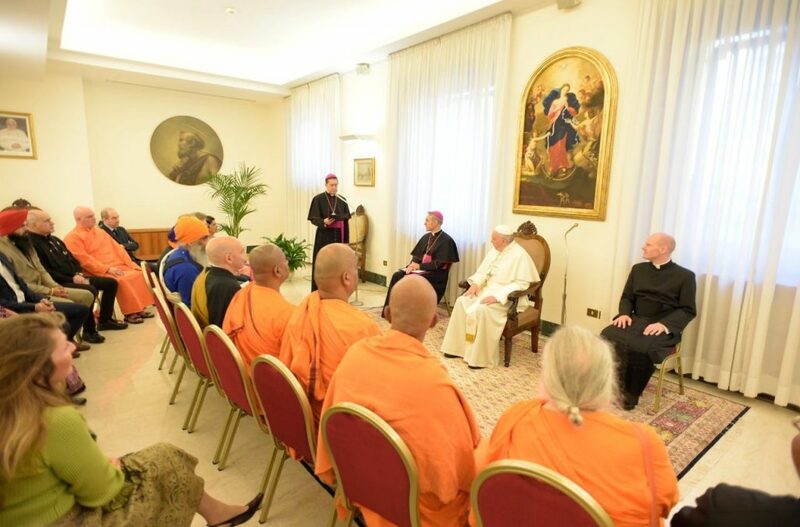 Before attending his weekly general audience, Francis met with a delegation from the Dharmic religions – Hinduism, Buddhism, Jainism and Sikhism – who were in Rome attending an interreligious conference. Although it is a concept with various meanings ranging from cosmic law and order to proper religious practices, dharma is a key philosophy within the four religions that originated in India. “We appeal to religious leaders, professors and followers of our religions to build bridges and unite our hands with all people of good will to contribute in building peace in the world today and tomorrow,” the statement said. Francis also met with a group of Buddhists from Thailand who gave him a translation of an ancient text that was given as a gift to Pope Pius XI in 1934 by the late Thai King Rama VII, the last absolute monarch of the country. According to the Asian church news portal ucanews.com, the Vatican commissioned the monks of Bangkok’s Wat Pho Temple to translate the 200-year-old Buddhist scripture written in the ancient Khmer language. A group of monks from the temple divided the text into seven chapters which included teachings on chants, poetic stories and several teachings and orders made by Gautama Buddha, the ascetic founder of Buddhism. “It is my heartfelt wish that Buddhists and Catholics will grow increasingly closer, advance in knowledge of one another and in esteem for their respective spiritual traditions and offer the world a witness to the values of justice, peace and the defense of human dignity,” Francis said. The 185-page text took 11 months to translate into Italian and will be displayed at the Vatican Museums. It will also be translated into seven other languages, including Chinese, French and Spanish, ucanews.com reported.